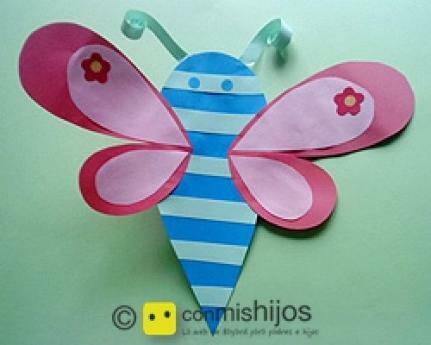 With this childrens craft, children will be able to make a funny activity and you they will also be able to make the dragonfly fly with their own hands. To review and practice notions of simple geometry. Draw a big drop in a blue card and cut it out. In a lighter blue paper cut out thin rectangles and glue them on the drop, leaving a space between them. It will be the dragonflys body. Use another rectangular stripe of paper of the same colour than the body to make the antennas. Glue them behind the dragonfly and roll the point a bit. Turn the dragonfly and glue a strip of paper loose enough to put your finger in. It is for making the dragonfly fly.